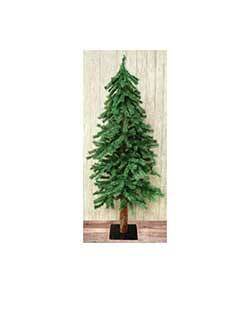 Christmas Trees, from small bottlebrush trees, tabletop trees, or larger lit trees, something for every room and style! 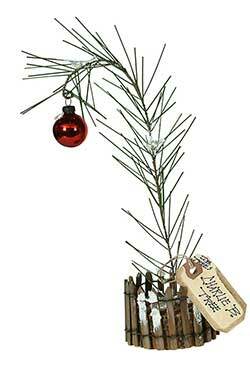 Darling little sprig tree with single ornament, base accented with a mini fence and aged tag. Gold & Silver Bottlebrush Tree, by Raz. Vintage-style bottle brush tree with ball oranments. 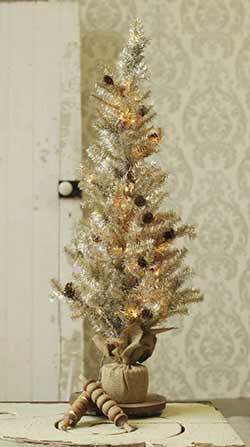 This one features gold and silver ornaments on anivory tree. Lighted Snowy Tree, by Raz Imports. Totally unique lighting accent! 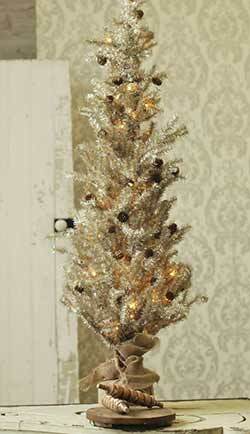 Brown wrapped wire twiggy tree with 36 warm white LED rice lights. Measures 36 inches. UL certified, plugs into a standard electrical outlet, cord is 16 feet long. Lights for approximately 30,000 hours. Part of the Owl Be Home For Christmas Collection. 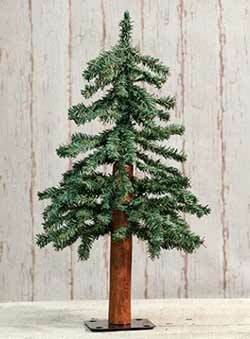 Long, artificial pine needles give this tree a full shape. It's size makes it versatile as a winter accent. 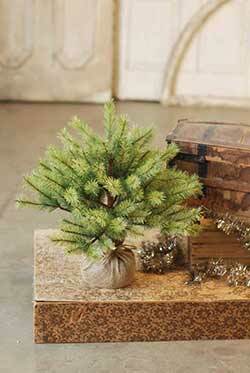 Long, artificial pine needles give this tree a full shape. 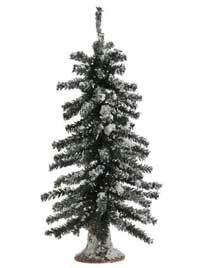 The tree’s stature makes it a versatile and wintery accent. Pastel Bottle Brush Tree, by Bethany Lowe. 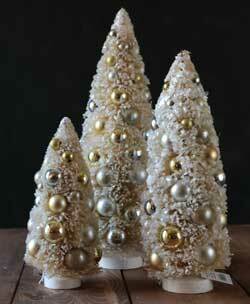 Stunning, retro-style ivory bottle brush tree, full metallic balls in pretty pastel colors. 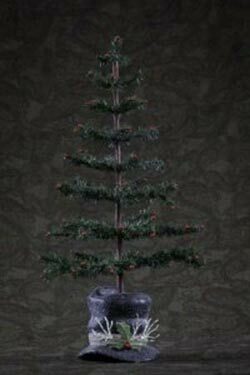 Sold individually - Choose the 5.5, 6.5, 8.5, or 10 inch tree. Dusted with mica glitter, wooden base. 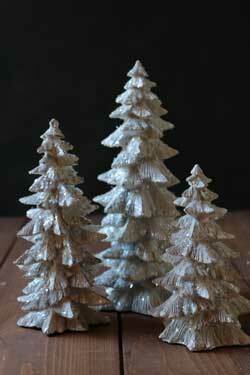 Features antique-style silver branches accented with an array of miniature pine cones. 3 foot tall. 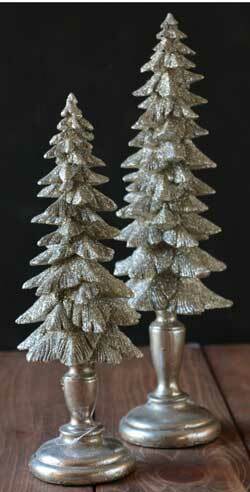 Features antique-style silver branches accented with an array of miniature pine cones. 4 foot tall. Red & Aqua Bottlebrush Tree, by Raz. Vintage-style bottle brush tree with ball oranments. This one features red, silver, aqua, and mint ornaments. 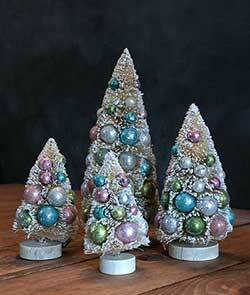 Sold individually - Choose the Small, Medium, or Large Tree. Part of the Home For Christmas Collection. Measures 9, 12, or 15 inches. Made of sisal and plastic. 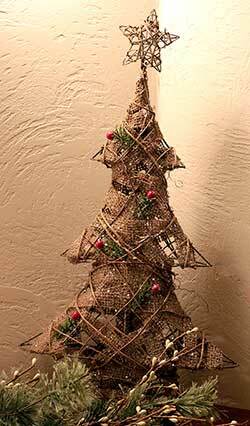 Small Feather Tree, by Primitives by Kathy. 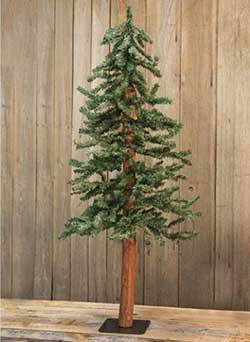 Authentic goosefeather tree, dyed green with a turned wood base. This is for the brighter, grassy green colored tree. An Annie Schickel design. Measures 18 inches. Purposefully antiqued for a primitive look. Features a heavy coating of white snow on each branch, and a burlap wrapped base. 18 inches tall. 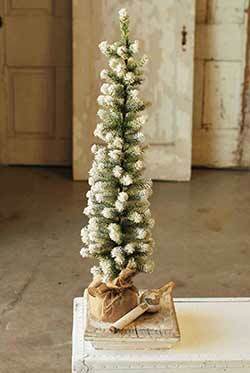 Features a heavy coating of white snow on each branch, and a burlap wrapped base. 24 inches tall. 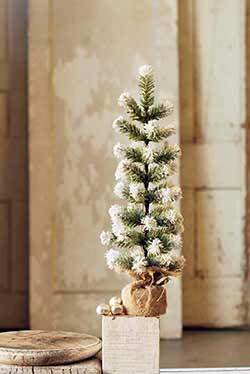 Features a heavy coating of white snow on each branch, and a burlap wrapped base. 36 inches tall. Snowy Pine Tree, by Raz Imports. 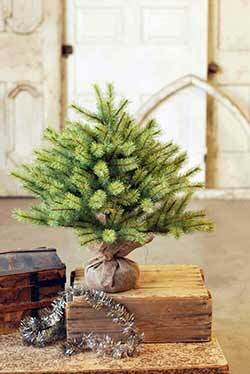 Tabletop tree, perfect for mantles, shelves, tuck into small spaces, etc. Leave as is, or decorate with tiny ornaments. 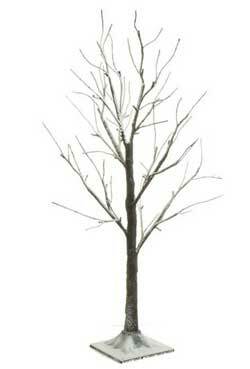 This is for the MEDIUM tree. Measures 19 inches tall. Two other sizes available. 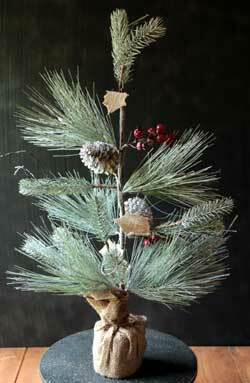 Note: comes a bit squished for better traveling, simply unwrap and "fluff" the branches to make it look pretty! Made of plastic. Snowy Tree, by Hanna's Handiworks. 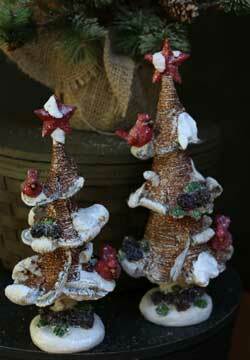 This resin tree is accented with snow, cardinals, pinecones, topped with a star. Snowy Woodland Tree Figurine, by Raz Imports. 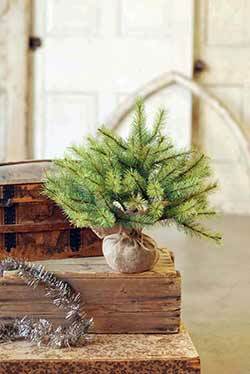 Make a statement on your mantel or table with one of these beautifully rustic woodland trees! 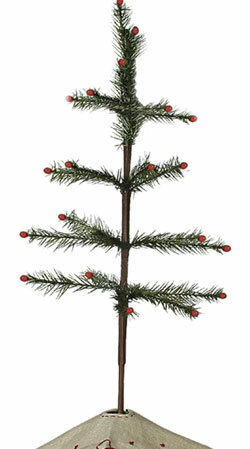 Top Hat Tree, by ESC and Company. 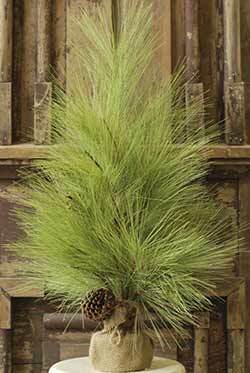 A wonderful accent to last all winter long, this black top hat is dusted with mica glitter and topped with a green feather-like tree. Measures 28 inches. Top hat made of paper pulp plaster. White Bottlebrush Tree, by Raz Imports. 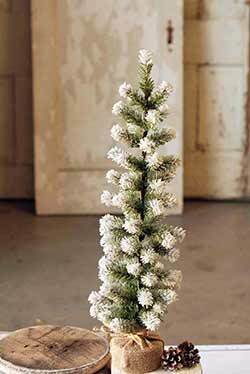 Perfect for your winter display, this bottle brush tree is snowy, glittery, and white. 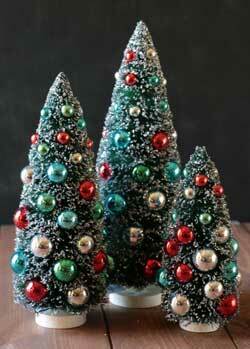 Sold individually from two sizes - Choose the Small, Medium, or Large tree. Measures 7.5, 9, or 10 inches. Part of the Arctic Palace Collection. 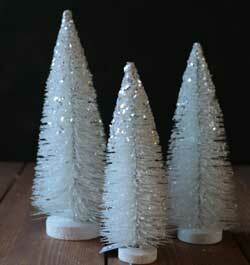 White Glittered Trees, by Raz Imports. 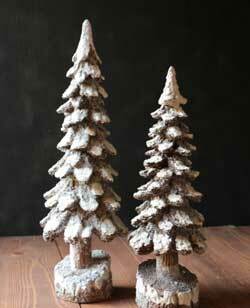 Perfect for your country winter display, these resin trees are painted an off white and aged, with a light dusting of mica flakes adding a small touch of shimmer.